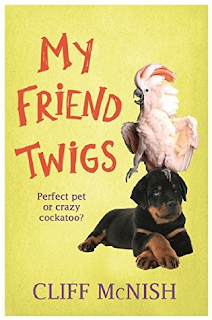 Candy Gourlay chats with author Cliff McNish, whose new book My Friend Twigs is out now. CANDY: Hey Slushpile people, meet author Cliff McNish. Back in 2013, Cliff talked to us about Deepening Character - it was one of our most popular blog posts of that year. Lucky us, he's agreed to come back to talk to us some more. 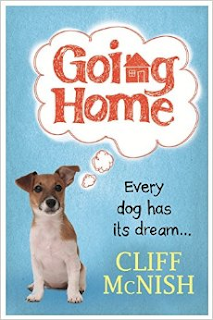 Cliff, you're known mainly for your creepy teen fantasies and ghost stories but recently, you've written two tender and funny animal stories for 8-12 year-olds. Why the change? CLIFF: Actually, it all started when my wife passed away three years ago. We’d been together for twenty-two years, and I couldn’t find any peace of mind. I’d been commissioned by my published, Orion, to write another ghost story, and I just felt weighed down by it. I kept trudging on, but day after day I wrote less and less until finally ... I just stopped. I didn’t want to be in this dark place. I had enough darkness going on in my life. CANDY: What did you do? CLIFF: For about two months I was just numb, writing nothing, doing nothing. Or at least I can’t remember what I did. The first sign that anything was changing was when I started to get these strange little funny ideas in my head – imagine a rabbit who lost his nose, or a polar bear that got tired of fish. Picture book territory, I guess. I didn't know where this stuff was coming from. But it wouldn’t go away. I kept pushing it back, but sillier and sillier ideas continued coming into my head. CANDY: Which leads us to your current extraordinary authorial character change. Since we'd spent over two years fostering rescue dogs I had plenty of stories to use, though I never took the suggestion seriously. Other people wrote those sort of poignant, funny stories much better than me, didn't they? But now the idea returned. And once I remembered it was her idea the characters took on an instant, vivid life. I could see Ralph, Bessie, Mitch and Fred barking away. I knew exactly what their stories were. CANDY: I loved Going Home ... it's a real about face to write a book for seven to 12 year olds after your last scary thriller, The Hunting Ground, which has an age warning on the back. And now, you've done it again for the same age group as Going Home, with a mad cockatoo and a girl. What made you write an animal story about a bird? CLIFF: I was trawling the internet when I came by chance across film of a pet moluccan cockatoo screeching non-stop. Moluccans are huge birds, and so noisy that I wondered how anyone could stand them. And then I wondered what would happen if a girl ended up having to look after such a bird? What would their friendship be like? And, if that friendship became deep enough, what if her father decided he couldn’t live with the bird any longer? How strongly would she fight for him? Moluccan cockatoos are fascinating creatures, actually. They’re not suited as pets at all, but many of the ones that get shackled that way end up with characteristics more human than those of cats and dogs. They can dance, for a start. They sing and talk. And, unlike dogs and cats, they live almost as long as us. Even their hearts beat at the same slow steady rate as a human heart. With their endless noisiness, their constant chatter, to me Moluccan cockatoos seem very human indeed. So it was fun to write a warm-hearted and hopefully funny story with a bird at its heart. CANDY: And here, my dears, is the cover of Cliff's new book: My Friend Twigs. Ready ... steady ... AWWWWWWWW! Last time Cliff visited the Slushpile, he gave us some great ideas on how to create a really powerful hero or heroine. But what about the VILLAINS? Cliff’s fiction is full of memorable ones, and I wanted to pick his brains about how to create one. After all that warm-heartedness, here's what he offered me. Enemies, opponents, antagonists, villains. Whatever you like to call them, we love to hate them! Try to imagine your favourite books or films without the evil guys. How about Harry Potter without Voldemort or Draco Malfoy? Or Lord of the Rings without Sauron and the orcs? Where wouldTwilight be without the James Coven? Or the Baudelaire children without Count Olaf? Readers adore enemies in stories because it’s a secret pleasure to explore the darker side of our imaginations. But the reason we DEMAND them is because the nasty things they do to our heroes and heroines help us to love them so much more. A good villain makes you sympathise with the hero so completely that the reader becomes desperate for them to succeed. Below are 18 top tips on creating great enemies in your own stories. TIP 1 - Make your villain cause pain and suffering to characters we either like or who are innocent or defenceless. This is the easiest and most effective way to make your reader hate a character. The more sadistic/merciless they are, the more we despise them. Voldemort attacks the defenceless Harry Potter when he’s just a tiny baby, instantly achieving villain status. Darth Vader destroys an ENTIRE PLANET. Tip 2 – Make them strongly want something the reader will hate them for. In the Lion King, Scar wants to be head of the Pride. In Stormbreaker Herod Sayle can’t wait to kill as many school children in England as possible. In Lord of the Rings Sauron wants to enslave the world. We automatically detest him for it. Tip 3 - Give the enemy control over your hero’s life. Miss Trunchbull in Matilda locks kids away in the vicious ‘chokey’. Put your own villain in charge where no one can stop them. Tip 4 - Make them appear more powerful than your hero. 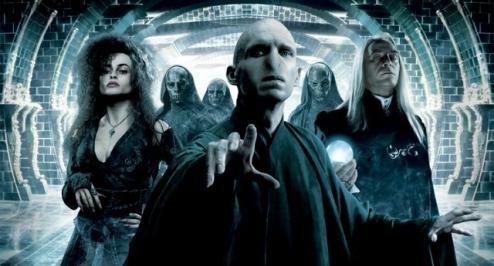 Harry Potter is just a school boy wizard, but Voldemort is a master of the dark arts. The reader becomes consumed with fear for the hero. Tip 5 – Ensure they break promises. Tip 6 - Make them a coward. Malfoy’s always hiding behind Crabbe and Goyle or the influence of his family name. A hero never does that. Tip 7 - Make them stuck up and condescending towards others. We hate characters who think they are superior to us, people who sneer or treat powerful, influential, rich people better than the poor and powerless. Tip 8 - Make them boast. A hero remains modest. When things go right for villains they take all the credit whether they deserve it or not. Tip 9 - Keep them humourless. 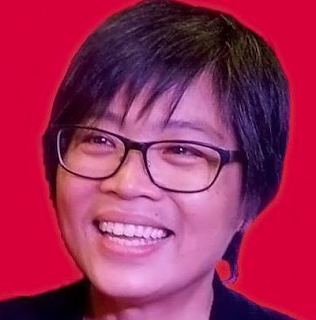 A heroine retains a sense of humour. When things go wrong for opponents, have them whine. Or, if they do joke, always make it at someone else’s expense. Tip 10 - Have them blame everyone but themselves. When things go wrong, villains always accuse and criticize others. Ensure yours do the same. Tip 11 – Emphasise their vanity. We automatically dislike anyone who brags about their looks, strength, deeds or the amount of money they have. Think of Moriarty. Tip 12 - Make them cheats and liars. Heroes are honest. Villains can’t be trusted. Tip 13 - Give them no regard for other people’s feelings. A hero is self-sacrificing and considers other people. Villains don’t care what happens to anyone else. They only help themselves. Think of the contempt the James clan in Twilight have for all humans. Tip 14 - Make them petty instead of noble. When Harry meets Ron on the train to Hogwarts he shares his food with him – he’s generous and warm-hearted. But what does Malfoy do? Cracks jokes about Ron’s poverty and talks about his ‘useless’ family. We despise him for it. Tip 15 - Make them ugly OR exceptionally handsome. We tend to distrust both. Think of the lovely but cruel step-mother in Snow White. Or Gaston in Beauty and the Beast. Tip 16 - Villains rarely doubt themselves. In Twilight hero Edward is constantly worried that he cannot trust himself with Bella. That makes him more human. In Hercules, Hades is only looking out for Number One. Himself. Villains just pursue their own interests and don’t question themselves or care who they step on. Tip 17 - Build up the suspense by not revealing the villain too soon. Sauron in Lord of the Rings is just a vast eye – and all the more alarming because we never really know what he looks or sounds like. To create real fear, keep you reader guessing for as long as possible. In Toy Story 3, cuddly Lotso Huggin Bear turns out to be a megalomaniac. Tip 18 – Have people talk about your enemy fearfully. The importance of this final tip is often neglected, but not by great storytellers. Characters are so afraid of Voldemort that they won’t even say his name. Sauron hardly appears in Lord of the Rings, but when you read the novel you always feel his presence. The reason is that even tough warriors like Aragorn never stop talking about him apprehensively. When great and brave characters like Aragorn and Gandalf regard Sauron as immensely dangerous, readers automatically get nervous. Have your own strongest characters do the same. Use them to stoke up the fear of your enemy. It works beautifully. These tips come from workshops that Cliff performs at school visits. If you are interested in Cliff's Villains Factsheet, you can contact him on his website and he'll be happy to send you one. Notes from the Slushpile thanks you for this brilliant guest post, Cliff! I love a good villain, me and here's a fanatstic DIY guide to villainy. I always think that giving a villain a white cat to stroke is a giveaway as well. Thanks, Cliff and loads of luck with My Friend Twigs! But that "white cat to stroke" can be over-egged - Disney's sidekick rule - every character has a creature sidekick - drives me crazy! Jaffar gets a parrot, Aladdin a monkey, Rapunzel a chameleon ... ARGH! I think I'd go for a guinea pig - the fluffier the better. They are under-rated as villain sidekicks. The cockatoo was the goody! I'm terrible at writing baddies. I can't help loving them and making excuses for their bad behaviour. Thanks, Cliff. I've not yet written a book with a proper villain. I think I could have fun trying (though perhaps not in a picture book). And it was generous of you to share your reasons behind your current books. Sending lots of positive thoughts your way. This is brilliant, Cliff. Read it before starting work yesterday and found that tip 18 was a perfect addition to the chapter I was working on. Thank you! And thank you Candy for another great post. When I read your characters talking fearfully about the baddy, I'll know why! This is an amazing and brilliantly useful post. Thank you Cliff and thank you Candy for not only cajoling Cliff to do this but also linking the previous one on character deepening which I read for the first time. I've printed them out as checklists and now I am transforming my hero and villain to ensure they are the best in their league. Story plot obviously has to change a bit to make them the best hero or villain they could be. :) Thanks again. it's a great piece. Note to self: invite Cliff to write for us more often. Fantastic. A very useful and enlightening analysis. Thank you for posting. Great stuff - thanks! I am goggle-eyed with all the pics - not to mention the idea of evil in picture books - mwah haaa. Hang on - just finished roughs for a shortened Hansel and Gretel picture book - now THAT witch fits the bill alright, ...tips 1-3 12 & 13 especially. Perfect! But let's not forget who the killers are in Hansel and Gretel. Three Cheers for Independent Bookshops!